The team continues to be focused on releasing a collection of interlinked features in a couple of weeks. Balancing the beginning of the crafting tree, resource collection and resource usage. We will also start applying the updated and final GUI design skin to the game, but this will not be part of the next release. Work continues on the new “smart stacking” feature. This allows variations of an item, for example a metal hammer and an alloy hammer, or colour blocks from different worlds, to be stacked together to save inventory space. All the standard UI actions within the backpack involving these collections of items are now functional. Next is support for crafting and all the other item inventories, including: trading, machine inputs, plinths, etc. There have been many World Builder stability improvements and fixes, and a new feature added for procedurally Named Regions. This feature creates a collection of thematic regions per world and gives them a descriptive name. The regions are then discoverable by explorers which contributes to progression. They also act as a way of describing your location, “South of Sherwood Forest”. The Portal Transitions have been made even smoother - but still not perfect, and we finally fixed the widespread “Z fighting” problem which was most noticeable on the character eyes, foliage and portal edges. We also now have a system for upgrading “components” in the game - which means we will be able to add or extend game features without having to reset player data. This week has been about pulling together many features that have been worked on over the last weeks and months and preparing for the coming big release, which will see everything put into the Live version of the game. @luke-turbulenz has been at the forefront of this with lots of play testing and balancing to make sure the game is as fun as possible. @Tobelawe has been polishing the Earth-like, spawn word config, and starting to work on other more extreme worlds. @olliepurkiss has been working on the Warps, Portals and Locations design, more technical work on analytics capturing, and working with the other guys as and when needed. And as a special treat he spent some time sorting through all the outstanding bugs – what fun. Creatures concepts - finalising master sheets for the first six creatures showing: all progression+power stages, environmental+elemental enhancements, exoticness, and world tinting. Weapon axe models - higher resolution 1st person versions and final progression design. Pipeline - wrangling with the coders for the Hunter model and rig. Pipeline - working on a better item positioning process for presentation in GUI, in 3rd person player hands, on plinths, in storage and on the ground. 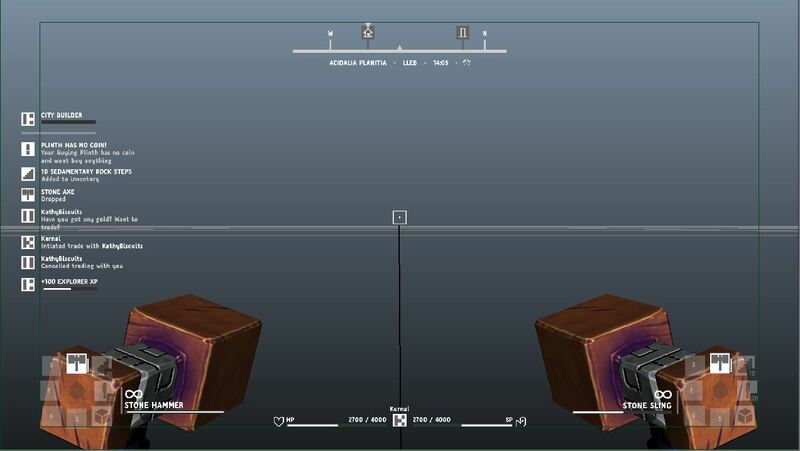 Animation - finalised tools and weapons positioning in 1st person also considering the new Hud design. Block texturing iteration - Gleam lantern, foliage specular iteration. 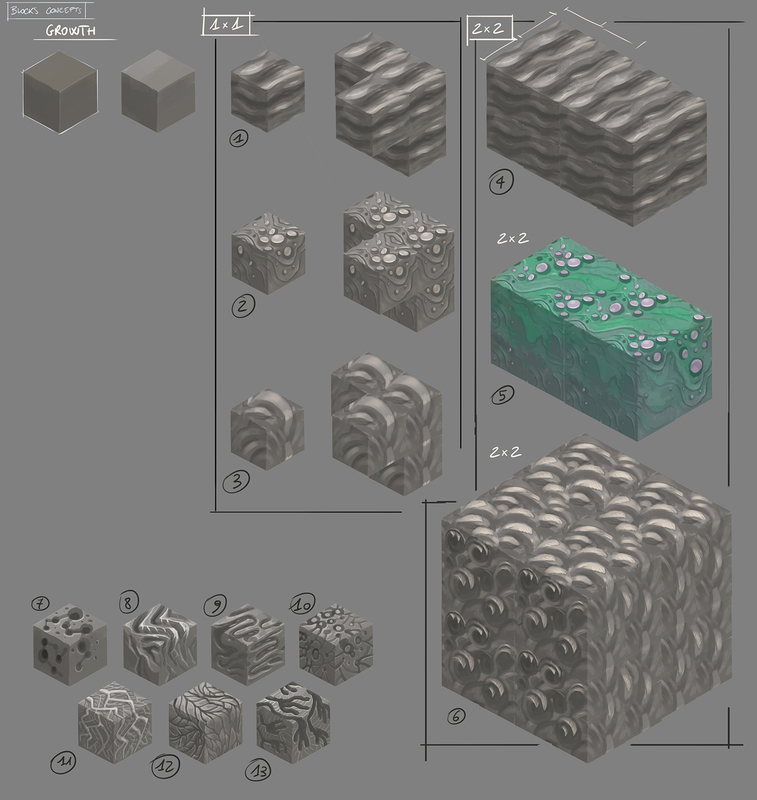 Blocks - fixing up lots of textures for tinting. 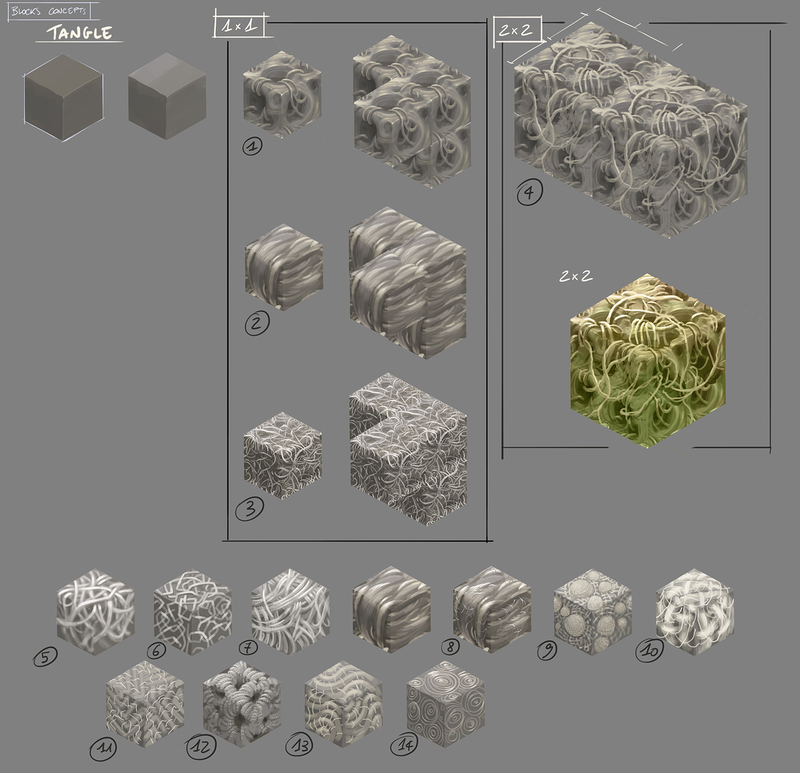 Block concept iteration - Growth, Tangle - in response to community feedback. x … … … … … . . .
Those growth and tangle concepts look pretty darn good! (Especially the colored ones you’re focusing on) They seem a lot easier to distinguish compared to the current in game textures. Could you guys show us what range of colours you’re going to allow? I’m interested with the variety you guys are producing. man, i keep up with all the dev weekly updates. i’m so eager for this game to be 1.01! I’m going to be completely honest. The first picture makes me NSFW - read it backwards. It would be awesome if there were lots of different variants of tangle and growth, all in which intertwine well together. also if the growth slowly spread to other blocks. Slowly. I really like spaghetti block, I will definitely build a house of it!